August 29, 2013 - "Press Releases"
San Diego, CA – August 2013 – TDK Corporation announces the extension of the TDK-Lambda GWS500 series power supplies with the addition of two low output voltage models. Combining the same high efficiency, high power density and low standby power characteristics as other models within the GWS500 series, the 5V 80A and 7.5V 67A models are well-suited for fitting into 1U enclosures. The GWS series is a 400W to 500W ac-dc, forced air-cooled power supply that achieves up to 90% efficiency, dramatically cutting the heat generated in industrial, LED, display/signage, IT, traffic controls, automated service, kiosks, test & measurement, and audio/video applications. Featuring a 4.1 x 8.6 inch footprint and 1.6 inch height, the GWS500 is one of the smallest products in its class. This series is now offered in six models with nominal outputs of 5V, 7.5V, 12V, 24V, 36V and 48V. To accommodate non-standard system voltages the GWS500's output is user-adjustable, either via the built-in adjustment potentiometer or by injecting an external programming voltage. Where peak power is needed, for example for motor start-up, the 24V and 36V models can deliver up to 600W for 10 seconds. The supply can be operated at full load from -25 to +50°C ambient temperature and up to +70°C with suitable derating. 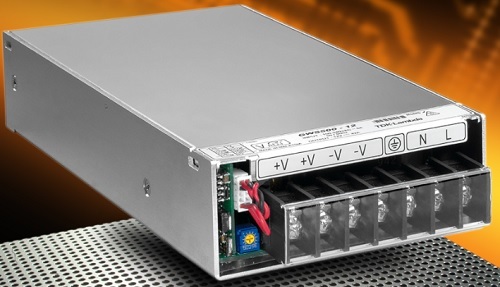 These power supplies include overvoltage, overtemperature and overcurrent protections. Also included are 5V/0.3A standby output, remote on/off, and DC Good signal, as standard. The GWS500 operates from 85 – 264VAC, is UL/EN/IEC 60950-1 safety certified (2nd Edition) and carries the CE mark. All models meet EN61000-4-X immunity and EN61000-3-2 harmonic correction standards. The TDK-Lambda GWS500 series is available in stock for immediate sale.